1. OVERVIEW Domino’s Pizza is the No. 1 Pizza Delivery Company in the world and the undisputed pizza delivery expert. The Company has a unique business and operation model and is a pioneer in the fast food industry. Since 1960, Domino’s Pizza has successfully expanded from 3 outlets in the United State to 9,350 stores operating in seventy countries. Domino’s operation in Malaysia and overseas uses the franchise model. The parent company, Domino’s Pizza LLC is head quartered in Michigan, United State of America. It maintains overall control on the sourcing and supplying of raw materials to the master franchises and enforces quality of the service and products sold. Founded in 1960, Domino’s Pizza is the recognized world leader in pizza delivery operating a network of company-owned and franchise-owned stores in the United States and international markets. Domino’s Pizza’s Vision illustrates a company of exceptional people on a mission to be the best pizza delivery company in the world. 2. HISTORY The legend of Domino’s Pizza dates back to December, 1960 with the purchase of a small pizza shop in Ypsilanti, Michigan by brothers Tom and Jim Monaghan. The brothers bought the restaurant from friend Dominick DeVarti for USD500 cash and assuming the stores USD8,000 debt (Dicke, 1992). Neither Tom nor Jim had the intention of making the restaurant business their career, but rather saw the opportunity as a part-time venture to help cover the cost of their studies at the nearby University of Michigan. By June the store was earning a profitable USD400 a week but briskly fell off when students at the University went home for summer. Faced with the prospect of a slow phase, Jim sold Tom his half of the business in..
Domino’s One Brand -Putting People First -Demanding Integrity -Striving for Customer Loyalty -Delivering with Smart Hustle ; Positive Energy -Winning by Improving Results Everyday Making pizza since 1960… Like most corporate success stories, Domino’s started out small – with just one store in 1960. However, in 1978 the 200th Domino’s store opened, and things really began to cook. By 1983 there were 1,000 Domino’s stores and 5,000 in 1989. Today, there are nearly 10,000 stores – including more than 5,000 outside the United States. Domino’s launches its website (www. dominos. com). * Domino’s rolls out flavored crusts, for limited-time-only promotions, nationally for the first time in company history. * The company reaches record sales of $2. 8 billion system-wide in 1996. 1997 * Domino’s Pizza opens its 1,500th store outside the United States, opening seven stores in one day on five continents simultaneously. * Domino’s Pizza launches a campaign to update the company logo and store interiors with brighter colors and a newer look. 998 * Domino’s launches another industry innovation, Domino’s HeatWave®, a hot bag using patented technology that keeps pizza oven-hot to the customer’s door. ;;;; * Domino’s Pizza opens its 6,000th store in San Francisco, Calif. in April. * Domino’s Pizza founder, Tom Monaghan, announces his retirement to pursue other interests, and gives up ownership of the company to Bain Capital Inc. 1999 * David A. Brandon is named Chairman and Chief Executive Officer of Domino’s Pizza. * The company announces record results for 1999, with worldwide sales exceeding $3. 6 billion. Revenues increased 4. 4% over 1998. | | | 2000s2000 * Domino’s Pizza International opens its 2,000th store outside the United States. * Domino’s Pizza celebrates 40 years of innovation and delivering pizza to homes around the world. During the past four decades, Domino’s has paved the way for businesses involved in food delivery, employing practices that have set the standard in the industry. * Domino’s Pizza announces record results for 2000. Worldwide sales exceed $3. 54 billion. Revenues increased 5. 3% over 1999. 001 * Domino’s introduces Cinna Stix®, a new permanent dessert item, to its menu. * Domino’s launches “Get the Door. It’s Domino’s. ” advertising campaign. * Domino’s 7,000th store opens in Brooklyn, N. Y. ;;;; * Domino’s launches two-year national partnership with the Make-A-Wish Foundation® of America. * Domino’s stores in New York City and Washington, D. C. , provide more than 12,000 pizzas to relief workers following the September 11 tragedy. Domino’s establishes a team member matching funds program to financially assist the American Red Cross and donates $350,000 to the Disaster Relief Effort. Domino’s Pizza International division establishes Domino’s first regional resource center with the majority stake purchase of the franchise in the Netherlands, setting the stage for expansion on the European continent. * Domino’s pizza announces record results for 2001. Worldwide sales exceed $3. 78 billion. Revenues increased 6. 8 percent over 2000. 2002 * In February 2002, Domino’s Pizza acquired 82 franchised stores in the Phoenix, Ariz. , market, making it the largest store acquisition in the company’s history. In August 2002, Domino’s kicked delivery up a notch with the introduction of Domino’s Pizza Buffalo Chicken Kickers™ and marked the creation of a whole new surprising category – premium chicken delivered right to the door! 2003 * Domino’s announces an exciting multi-year partnership by becoming the “Official Pizza of NASCAR. ” * Domino’s is named Chain of the Year by Pizza Today magazine, a leading pizza trade publication. * Domino’s combines two culinary classics – pizza and Philadelphia Cheese Steak – to create Domino’s Philly Cheese Steak Pizza. 004 * Domino’s launches Domino’s Cheesy Dots™, delicious round balls of dough covered in a blend of zesty melted cheeses. * Domino’s becomes an associate sponsor for the Drive for Diversity program, a minority driver development program designed to provide a steady pipeline of well-trained and supported minority drivers for the NASCAR circuit. * Domino’s Pizza Inc. , the recognized world leader in pizza delivery, becomes a publicly traded company on the New York Stock Exchange (NYSE) in July 2004, under the new ticker symbol DPZ. * Domino’s announces a three-year partnership with St.
Jude Children’s Research Hospital. St. Jude was selected as Domino’s “charity of choice” by franchisees and team members. >>>>2005 * Domino’s Pizza celebrates the completion of the three-year renovation of its World Resource Center in Ann Arbor, Mich. The renovation marks the first major improvement to the company’s world headquarters since Domino’s founder Tom Monaghan opened the sprawling Domino’s Farms office complex. * Domino’s Pizza Australia opens its 400th store in Aspley, Brisbane. * Domino’s Pizza in the United Kingdom celebrates the opening of its 400th store in Wadsley Bridge, Sheffield. Domino’s raises $1. 2 million for St. Jude Children’s Research Hospital during its second annual “Thanks and Giving” campaign. * Domino’s Pizza efforts worldwide raise $220,000 to support southeast Asia tsunami relief efforts. * Domino’s Pizza launches its American Classic Cheeseburger Pizza in conjunction with its appearance as a featured task on the NBC hit reality show, “The Apprentice. ”2006 * Domino’s celebrates the opening of its 8,000th store with simultaneous celebrations of the opening of its 5,000th U. S. store in Huntley, Ill. , and its 3,000th international store in Panama City, Panama. gt;>>> * Domino’s indefinitely extends its relationship with St. Jude as its national charitable partner. Domino’s raises $1. 34 million for St. Jude during its third annual “Thanks and Giving” campaign. * Domino’s Pizza introduces Brownie Squares — warm, delicious, bite-sized brownies delivered with a fudge dipping sauce. 2007 * Domino’s introduces OREO® Dessert Pizza—a thin dessert-style crust that’s layered with vanilla sauce and covered with OREO® cookie crumbles and then topped with sweet icing. * Domino’s introduces its Veterans and Delivering the Dream franchising programs. Domino’s rolls out online and mobile ordering. >>>> * Domino’s is ranked in the Top 10 for the ninth time in Entrepreneur magazine’s annual listing of great franchise opportunities. 2008 * Domino’s becomes the largest sandwich delivery company overnight when it launches a line of oven baked sandwiches. * Domino’s launches a food delivery industry first: Domino’s Tracker™. This revolutionary technology allows Domino’s Pizza customers to follow the progress of their order online, from the time they click the “Place Order” button (or hang up the telephone), until the order is delivered. 009 * Domino’s introduces American Legends, a line of premium pizzas featuring toppings such as roasted red peppers, spinach and feta cheese. * Domino’s introduced Breadbowl Pasta and Chocolate Lava Crunch Cakes. * At year’s end, Domino’s scraps its 49-year-old pizza recipe and launches its “new and inspired pizza” with an unusual advertising campaign. ;;;;| | | 2010s2010 * Bain Capital sells its interests in Domino’s Pizza. * In March, Domino’s Pizza opens its 9,000th store worldwide, with dual celebrations in New Delhi, India and New Orleans, La. gt;>>> * Domino’s raises $2. 7 million during the 7th annual St. Jude Children’s Research Hospital® Thanks and Giving® campaign, marking the largest single charitable donation in the company’s 50-year history. * Domino’s Pizza celebrates its 50th anniversary in December. 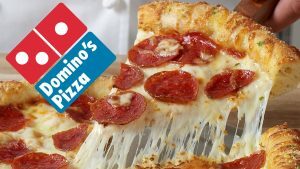 2011 * Pizza Today Magazine names Domino’s its “Chain of the Year” for the second straight year – making the company a three-time overall winner, and the first pizza delivery company to receive the honor in back-to-back years. Domino’s continues to revamp its menu, launching a new recipe for Buffalo Wings and Boneless Chicken, a new line of Domino’s Artisan™ Pizzas using premium ingredients and two new bread sides – Stuffed Cheesy Bread and Parmesan Bread Bites. * Patrick Doyle is named No. 1 Best CEO of 2011 by CNBC. * Domino’s Pizza is recognized as the Official Pizza of the NCAA® and Official Pizza of NCAA® March Madness®. The partnership lasts from 2011-2013. 2012 * Domino’s debuts its ordering app for Android phones. This, in addition to its existing iPhone app which debuted in 2011, offers a Domino’s mobile ordering app to more than 80 percent of smartphones. * Domino’s Pizza debuts its mobile ordering technology to Amazon’s Kindle Fire by launching the Domino’s Pizza app into the Amazon Appstore for Android. This marks the company’s first appearance in the Amazon Appstore for Android and the company’s first Android tablet app. * In August, Domino’s launched its “Ultimate Delivery Vehicle” design competition – a campaign as unique as anything in its 52-year history. Pizza lovers and car enthusiasts were asked to help Domino’s revolutionize the pizza industry by contributing to the design of the Ultimate Delivery Vehicle – something Domino’s fans and customers could see as part of the delivery experience in the future. Stay tuned! * Domino’s unveiled its new logo and ‘Pizza Theater’ store design…marking a significant change in the customer experience at Domino’s! ;;;; * Domino’s debuted the biggest product launch since the redesign of its core hand-tossed pizza, launching its Handmade Pan Pizza in September. Made from fresh, never-frozen dough, the terrific product marked Domino’s entry into the Pan Pizza scene in a big way! | | | Domino’s 101: Basic Facts PIZZA, PRODUCT & MENU: * 85% of the items on Domino’s menu are new since 2008. * There are more than 34 million ways to create a single Domino’s pizza. * 30 slices of pepperoni go on a medium pepperoni pizza (40 slices for a large peperoni pizza). * Pepperoni is the most popular U. S. pizza topping, followed by mushrooms, sausage, ham and green peppers. * Breadsticks were the first national nonpizza menu item offered at Domino’s, in 1992. Domino’s World’s Fastest Pizza Maker Pali Grewal can make three large pizzas in just 39. 17 seconds. STORE ; FRANCHISE OWNER FACTS: * Domino’s is 95% franchise-owned. * Domino’s has about 1,100 independent franchise owners in the U. S. * More than 90% started their careers as drivers or assistant managers. * Domino’s delivery experts cover 10 million miles each week in the U. S. alone. INTERNATIONAL & GLOBAL FACTS: * Domino’s delivers more than 1 million pizzas a day worldwide. * Domino’s operates 10,040 stores in over 70 countries around the world. * More than half of Domino’s sales now come from outside the U. Founded as a single store in 1960, Domino’s Pizza today stands as the recognized world leader in pizza delivery. From the beginning, we have been dedicated to the best of service, quality products and delivery excellence. Domino’s Pizza Corporate FactsEach day, more than 1 million customers enjoy hot, delicious Domino’s Pizza products on every inhabited continent on Earth, because we operate over 10,000 stores in more than 70 countries; each and every store dedicated to our focus of providing great-tasting pizza – whether it be delivered directly to your door or available for carryout. We pioneered the pizza delivery business back in 1960, and our total system sells more than 400 million pizzas worldwide every year. Great Name Brand Recognition Domino’s Pizza is recognized as a Megabrand by Advertising Age magazine, and has been named “Chain of the Year” by Pizza Today, the leading publication of the pizza industry, three times – including back to back wins, the first ever company to do so, in 2010 and 2011. Strong Teamwork Domino’s Pizza Inc. s leadership, team members and franchisees aspire to achieve our collective vision of being Team Members and Franchisees on a mission to be the best pizza delivery company in the world. We operate through a set of Guiding Principles founded on integrity and putting people first (our shareholders, customers, suppliers and employees) – which serve as our compass as we manage our business. Our Products Domino’s Pizza offers Classic Hand Tossed, Crunchy Thin Crust, Artisan and Handmade Pan pizzas, with a wide variety of toppings. Additional menu items include Stuffed Cheesy Bread, Buffalo Wings & Boneless Chicken, Chocolate Lava Crunch Cakes and Cinna Stix®. We also proudly serve icy cold Coca-Cola® products. Domino’s has recently expanded its menu significantly to also include Domino’s American Legends™ specialty pizzas, Oven Baked Sandwiches and BreadBowl Pastas™. In late 2009, Domino’s debuted its Inspired New Pizza – a permanent change to its core hand-tossed product, reinvented from the crust up with new sauce, cheese and garlic-seasoned crust. Innovating the Pizza Delivery Business Throughout our history, in addition to pioneering the concept of efficient delivery of made-to-order pizzas, we have been part of innovations that have made significant impact on the pizza and delivery industries. Here’s a look at some of our innovative thinking: * Domino’s HeatWave® Hot Bag Domino’s HeatWave hot bags were introduced in 1998 to keep pizzas oven-hot during normal delivery. Originally, each hot bag contained a patented heating mechanism charged by plugging into an electric outlet at the store. The outer material of the bag is made with water-repellent nylon, which replaced the less sturdy vinyl material previously used. Domino’s has continued to innovate and evolve the technology, removing the electric cord and heating each bag via an induction heating system. The latest edition of Domino’s HeatWave bags relies solely on a patented insulation system that keeps pizzas both hot and crisp – completely eliminating the need for electricity. * A better box Domino’s was the innovator behind the sturdy, corrugated pizza box, which keeps moisture from weakening the box, while preventing cheese from sticking to the top during delivery. Car-top sign – in 3-D! Today, it’s hard to miss pizza delivery cars — thanks to Domino’s Pizza. Domino’s invented the 3-D car-top sign, which is currently used by a variety of industries, including taxis and driving schools. Taking innovation a step further – in 2012, Domino’s launched its “Ultimate Delivery Vehicle” campaign, asking consumers and car enthusiasts to help design a pizza delivery vehicle in hopes of revolutionizing the industry! * Spoodle This saucing tool combines the best features of a spoon and a ladle, cutting down the time spent saucing a pizza. The Spoodle was introduced at the 1985 World’s Fastest Pizza Maker competition by the eventual winner, Jeff Goddard. * Domino’s Online Ordering – Pizza Tracker and Pizza Builder Domino’s launched online ordering in 2007, and in 2008 revolutionized the customer experience by launching its innovative Pizza Builder and Domino’s Tracker. Pizza Builder allows customers to see their pizza come to life on the computer screen, as toppings and crust styles are selected in real time. Domino’s Tracker allows customers to follow the progress of the order, from the time it’s placed until customers receive it. The experience has seen various looks, themes and interactive opportunities since its debut. While the Pizza Builder has since been mimicked by other pizza companies, we remain the only company offering the unique, engaging ordering experience of Domino’s Tracker. These innovations and others have helped us get better at what we love to do most: deliver great pizza to your door, efficiently and enthusiastically! Strong Distribution System To allow Domino’s stores to concentrate on making and delivering pizzas, Domino’s developed a central distribution and dough manufacturing system. This relieves stores from long hours making dough, grating cheese and preparing toppings. Today, Domino’s Supply Chain Services (SCS) provides high quality dough and ingredients nationwide, keeping the company’s pizza consistently delicious. In fact, through its network of 16 domestic distribution centers, SCS regularly supplies the nearly 5,000 U. S. pizza stores with more than 240 products. Other pizza and fast food companies in the U. S. have adopted this same system. | Success Factors * Domino’s is a powerful global brand. “Mega Brand” as defined by Advertising Age * Significant, ongoing investments in advertising result in broad consumer awareness * We are the #1 pizza delivery company in the U. S. * Largest share of pizza delivery channel and continued innovation…reinforced by our well-known tagline, “Oh Yes We Did! ” * We have a large and growing international presence. * Operate in over 70 countries and with more than 10,000 stores worldwide * #1 or #2 market share position in most of our top 10 markets * We have a strong and proven business model with superior returns. Strong unit economics: focused on efficient operating model; moderate cost to open; solid cash-on-cash returns * Franchisees have succeeded and have high renewal rates because the business model works forming solid partnerships * Voluntarily purchase from company supply chain system * Geographically diverse franchise base with no significant concentrations * Return on assets higher than the quick-serve restaurant peer average * We operate a profitable, value-added supply chain system. * Ensures quality and consistency Leverages purchasing power * Enhances franchisee partnerships through 50% profit sharing * Allows stores to focus on sales and service * Our leadership team has a track record of success. * Delivered strong results since 1999 change of control Our Commitment to Diversity Domino’s commitment to diversity is based on creating a unified and inclusive environment that respects and celebrates the uniqueness of our exceptional people who invest their time, talents and energies while striving to make our company the best pizza delivery company in the world. Our corporate offices are full of exceptional people supporting those team members and allowing them to stay focused on the task at hand. Domino’s office personnel support our nearly 600 corporate-owned stores, a system of 5,000+ domestic franchise-owned stores and an international franchise base that operates more than 5,000 stores in approximately 70 markets. We also manage our own distribution business, a rarity in the quick service restaurant industry. We have marketers and lawyers. Accountants and communicators. Trainers and lease negotiators. International business consultants and human resource representatives. Safety specialists and product developers. There’s many more dramatically different roles to fill, but they all have one thing in common: Domino’s Pizza people are fiercely proud of who we are and what we do. If you have those same traits, we’d love to have you on our team. As a company, we have plenty of growing left to do and many successes to celebrate. Come grow and celebrate with us. Corporate Benefits and Perks World Resource Center – Ann Arbor, Michigan A 200,000 square foot modern World Resource Center includes 27 conference and meeting rooms, updated research and development labs and gift store. The centerpiece is the spacious Welcome Center, which surrounds a four-story glass staircase and a Domino’s Pizza store at the base. The office is minutes from downtown Ann Arbor, and less than 30 minutes from Detroit’s Metropolitan Airport. Domino’s Pizza is located in a scenic rural setting in a building known as the Prairie House at Domino’s Farms Office Park, and whose external architecture was inspired by the works of architect Frank Lloyd Wright. Located in suburban Ann Arbor, this landmark facility offers a unique and architecturally significant building, surrounded by pastures, cultivated farmland, and wildlife habitat. The following on-site amenities are available to Domino’s team members at the World Resource Center: 1. Dining Facility 2. Free Fitness Center membership 3. Post Office 4. Deli/Sundry Shop 5. Dry Cleaner 6. Bookstore 7. Credit Union 8. Art Gallery 9. Hair, nail and massage salons 10. Petting Farm 11. Free Parking Benefits Domino’s pizza recognizes the best way to achieve success is to first ensure the satisfaction of its team members. Treating team members exceptionally well is just one way we are committed to putting our people first. Domino’s is proud to provide a fair and comprehensive rewards package. The development program in the Domino’s People First department is a unique opportunity for early career human resource professionals to complete a defined career development plan, gaining knowledge and experience in all capacities of the field. Domino’s Pizza is committed to the development of the participants and has purposely selected positions that support their progression with the expectation that we are investing in the future leaders of the department. The program is only successful if the participant is equally committed to their development and responsibilities. We expect candidates to get as much as they can from each rotation and willingly support the company’s objectives, no matter where the position is located. Each participant is required to complete three rotations. Two of the rotations will be in a core assignment that all participants must complete, and the third will be one of the additional assignments. Core Assignments: * Shared Services (Ann Arbor, Mich. ) * Primary point of contact for 12,000 corporate team members for PeopleFirst-related issues. * Support team member requests by executing PeopleFirst policies and procedures and initiating recommended improvements. Maintain team members’ electronic records. * Communicate and support PeopleFirst programs Marketplace (corporate market): * Support team members in resolving employee relations issues * Coordinate staffing and retention initiatives Additional Assignments: * Franchise/Employee Relations * Compensation * Benefits * Training & Implementation Program * Learning & Development * Human Resource Information Systems DPZ University From first line supervision to leadership development, DPZ University provides the classes and career paths necessary to become successful. Domino’s has a strong promotion from within culture and provides the necessary development to prepare individuals for future opportunities. Partnering with world-class organizations like Harvard Business School, Ninth House: The Leadership Development Company, Franklin-Covey, and others offer learning and development to achieve our vision of “Exceptional franchisees and team members on a mission to be the best pizza delivery company in the world. ” Accounting/Finance Program Our cash and general ledger accountant positions are the gateway to opportunity at Domino’s Pizza. The Supply Chain Centers responsible for dough production, warehouse and store delivery provides numerous training programs to acquire the skills necessary to be proficient including dough certification classes to ensure product quality, forklift certification, and numerous safety and defensive driving classes. Training provided in the following areas: * Facility Safety Organization (IPP) * Physical Hazards associated with job * Chemical Hazards * Safety guards built into machines equipment * Administrative controls in effect * Personal Protective Equipment (PPE) * Emergency Action Plans * Accident Investigation process Blood borne pathogen safety training * Electrical safety training * Personal protective equipment training * Back injury prevention training * Safety course Supply Chain Benefits and Perks Domino’s pizza recognizes the best way to achieve success is to first ensure the satisfaction of its team members. Treating team members exceptionally well is just one way we are committed to putting our people first. Domino’s is proud to provide a fair and comprehensive rewards package. Below are just a few of the generous benefits available to Domino’s Supply Chain team members. * Annual performance-based bonus * Quality equipment * Paperless logging Regular schedules * Single and team runs * Competitive medical and dental package * 401(k) savings plan with company match * Life insurance * Educational assistance * Employee stock purchase plan What We Do In Supply Chain From our nationwide network of 16 Supply Chain Centers, Domino’s Pizza Supply Chain strives to fulfill its mission of supporting more than 5,000 U. S. Domino’s Pizza stores by providing them with more than 200 different products. Supply Chain Management Management positions at Domino’s Pizza Supply Chain Centers offer you the opportunity to join a world-class company with: * A competitive salary. An excellent benefits package. * Opportunity for career growth. Our team leaders are involved in all facets of our business. The work is a combination of administrative and operational responsibilities performed throughout the Supply Chain Center. The best candidates are strong yet thoughtful leaders who have the ability to respect their team members and mentor them onto greater career development. If you care about the people who work for you and have the desire to encourage and assist in their career growth, you’re the type of leader we look for. What Types of Management Positions Are Available? Our General Manager Development Program is an excellent start to acquiring skills and learning the fundamentals of business operations. In addition to several requirements, it is necessary to work successfully in a team leader position (minimum of six months) to apply for the program. The program is customized for each individual and focuses on the following areas. Food Production Preparing and mixing fresh pizza dough is the responsibility of a production team member. The production team is the secret behind the great-tasting Domino’s Pizza consumers turn to when they’re hungry. If you have the desire to create a top-quality food product every day, then our production department is for you. Commercial Delivery and Service Drivers We look for team members with a commitment to safety and excellent customer service to be part of our Delivery ; Service team. Delivery ; Service drivers will drive a truck over an established route to deliver products to Domino’s Pizza stores. When you take the wheel for Domino’s Pizza Supply Chain, you are the face of our company to our customers. You’re interaction with the stores is crucial to our success. Many drivers build lasting relationships with customers in the fun and supportive family environment of Domino’s Pizza. Warehouse Our warehouse team members ensure that our customers receive each and every product they order, every time they order it. As a warehouse team member, your main responsibility will be to load, unload and move materials within or near the Supply Chain Center. You’re the one who makes it happen for us every day and you are an important piece of who we are. Customer Service As a Customer Service Representative (CSR), you are responsible for taking incoming orders from stores using a telephone and computer. A CSR talks with our customers regularly, taking their orders and solving concerns and problems. Our customers look to you for answers and direction. Your professional customer service expertise is essential to keeping our stores happy. What Qualifications Do I Need? These professional level positions at Supply Chain Centers require: * Strong team leadership skills. * Three years of experience in managing multi-function operations (preferably in transportation or supply chain). * A bachelor’s degree in a related field. * A willingness to relocate. Value Chain in Domino's Pizza. (2016, Dec 05). Retrieved April 22, 2019, from https://phdessay.com/value-chain-in-dominos-pizza/.